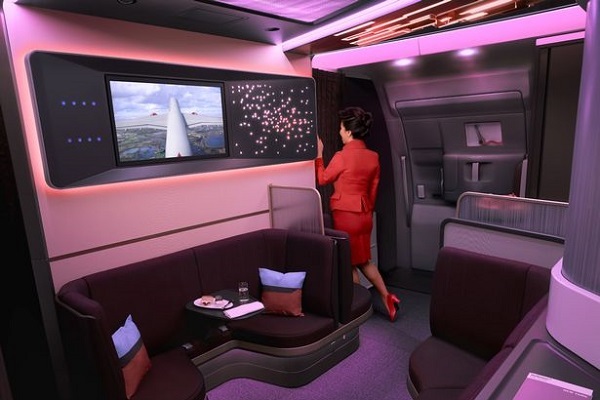 Headlining last week’s announcement was a new Upper Class section with a social space known as The Loft, featuring a seating area with a 32in screen TV along with cocktails and fine-dining options. Executive vice president Mark Anderson said of The Loft: "We wanted to do something that brought more people into the party – a more flexible space. You can have it for a meeting, you can watch a movie, you can have your dinner." 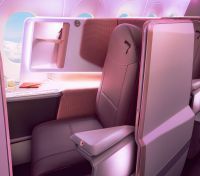 The new Upper Class seats are in the modified reverse herringbone pattern, with each one facing toward the window and reclinable to a fully-flat 82in bed. Each seat also features a partition for extra privacy and an 18.5in TV screen. Personalised mood lighting at each suite and improved reading lights are other features, along with deep mattresses and what Virgin calls the thickest pillow in the sky.